Know what your audience is saying, seeking, and feeling for actionable insights. Stay on top of market trends and relevant news with AI-driven insights. Improve customer relationships and win fans by engaging in the right conversations, faster. Find and respond to customer conversations that matter most with the ability to drill down into data by topic, sentiment, language, and geography. Act intelligently on web search insights based on age and gender demographics. Turn social conversations into new leads or support cases to strengthen customer relationships. Monitor brand sentiment and industry trends with sentiment analysis and web search data. Get instant insights from pre-configured queries that analyze up to last 30 days of social media content and 15 months of web search trends. Enhance the reputation of your products and services by engaging with influencers and sharing content. Quickly identify market and consumer trends so you can get ahead of your competition. Develop new market opportunities and drive business growth with insights, and stay on top of emerging news with customizable alert notifications. Spend less time setting up searches and more time acting on insights by using the AI-assisted query builder. 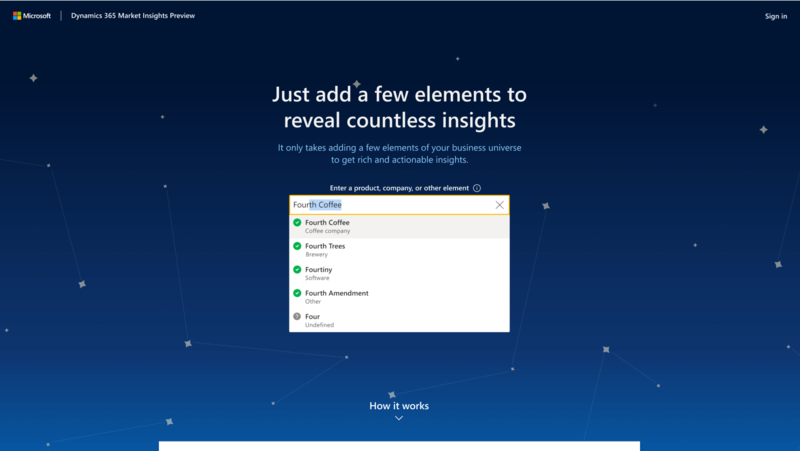 Customize the AI to your requirements and connect social media market insights to other Dynamics 365 data for the most up-to-date view of customers and prospects. Learn about current market availability and future expansion. Learn how to stay on top of market trends and get to know your customers even better.